Admittedly people might question why I should worry about what Technorati thinks of me. To be honest, I don’t care, but I do care that many of my favourite bloggers prefer to read posts by subscribing to technorati tags than to blogs. So if I want them to read my posts I need to understand how this blog search engine works. Also people use blog search engines to locate blogs worth reading – so I need to make sure my blog is showing up in blog search directory for my niche area. Mistakenly I thought everything was okay since I had seen my posts on Technorati. WRONG – When I did an advanced blog search using the term m-learning my sites were not being listed. If I want to have my blog to appear in technorati blog search directory I need to join Technorati and then claim my blog (and podcast sites). I also needed to use variations of the same tag term to ensure my blog is easier to locate. My blog and podcast site can now be located in Technorati blog search however ability to locate in search directory is affected by which variation of a tag is used in the search. See how Technorati mocks me? Both sites have been tagged on Technorati with m-learning and mlearning, so I have no idea. 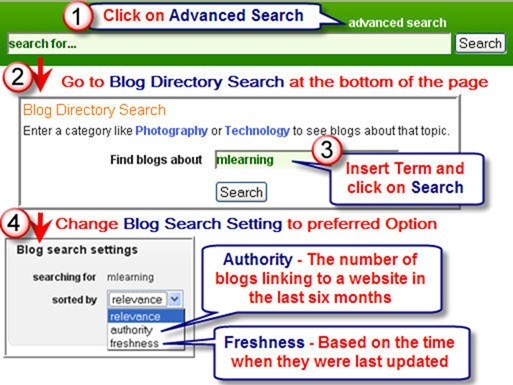 My original reason for searching Technorati was for my Day 14 task (Analyze Your Blog’s Competition for 31 Days Blog Project). While I read a lot of blogs I wanted to read more blogs in my niche area (mlearning), and I wanted to work out how bloggers are subscribing to Technorati tags. So I inserted the term m-learning into the search area. After several frustrating hours, of not being able to work out why all my search attempts using m-learning were giving me posts that had absolutely nothing to do with m-learning I realised that unlike their blog search, their basic search was not recognising m-learning as a search term. Instead it was giving me any post that had the term learning in it. Change the search term to mlearning and now I found the posts I wanted. But just to totally annoy me if I change the search term to “mobile learning” my search results were totally different. 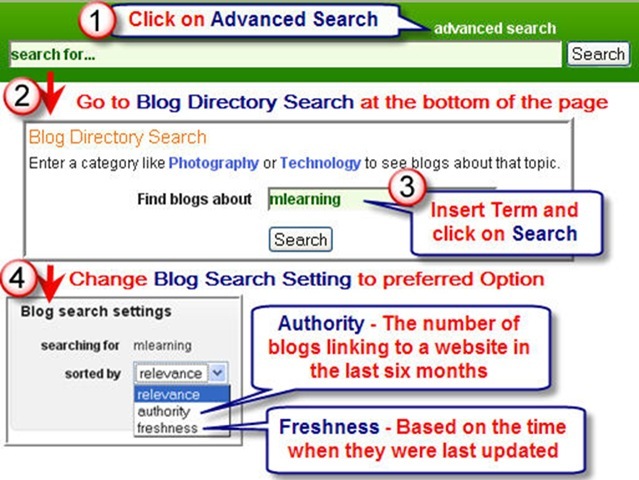 Technorati’s basic search appears to search for the terms within posts. So I need to have a good think about terms used for both tagging my posts and words used within my posts or alternatively I could start adding the desired technorati tags into my posts. You can subscribe to technorati tags by clicking on the subscribe icon and adding to your Feed Reader (or if your Feed Reader automatically locates the feed copy and paste the tag URL into your Reader). You are placing on the post the related Technorati tags rel=”tag”? You’ve got a lot of trackbacks. Loved the article. As for me, Technorati works fine. Thanks Gary and Kristin – still pondering about if I want to add the tag within my posts. At the moment I have subscribed to the technorati feeds for mlearning, mobile learning and elearning and the Google Blog Search feeds for the same terms. Yes – I am possibly crazy but it is helping me understand how a post looks in these feeds and I am coming across some great articles. Will give you an update later – as to my decision. What I have decided today is I need to improve how I tag. Yes there are a few links coming to this post. I am glad you liked the article. Definitely agree that it was a case of user error on my behalf not spending the time earlier to learn more about how blog search engines work. Also the fact that technorati is interpreting m-learning as learning in basic searches and is okay with it in blog searches suggests they need to make some adjustments. Fortunately I am getting a bit better at using technorati. I am still learning how to use Technorati, too. Thanks for the pointers. using technorati seems to be easy, but sometimes there are very awesome results in authorities and searches. thanks for the infos. Glad that my technorati tips have helped. Thanks Media tools for linking to my blog. I am definitely better using Technorati but still have a lot to learn. What I didn’t know was that you could subscribe to tags. That’s very useful! I also hadn’t considered my own use of tags on my blog itself in that I don’t think I used several variations. Very good advice! Thanks for pointing me toward this article! I’m not sure that I gain any traffic using Technorati but I have found lots of great new blogs to subscribe to and read so has definitely been worth it. Also have gained a better understanding of how other write on the same niche area as I do so it helps me with writing my posts – this way I am able to write them differently from how other people are writing them. Hi Christine – I am glad my post has helped you with Technorati. I have to admit it did frustrate me which is why I research it and wrote this post. Great post. I loved it. It is very descriptive and knowledgeable.